I'm cheap. And sometimes, my being cheap can be crazy expensive. Ironic, huh? When we just look at the price instead of looking at the value of the item, we frequently end up buying junk that just doesn't work as well or last as long. Over the last few years, I've learned that having less stuff makes us so much happier. This epiphany happened when setting up my 40 hanger closet and then took the rest of the house by storm. I realized that spending a little more up front for quality items that will last me years saves me quite a bit of money over buying cheap imitations frequently. To me, the value of an item is calculated by looking at the cost of the item and dividing it by how many times it was/will be used by me. This is also called “cost per use”. So if a new sweater costs me $40 but I wear it 20 times every winter for 3 years, then it's cost per use is $40 divided by 60 which equals $0.67 per use. If I were to buy a really cheap sweater for $10 that I kinda liked but not really, and only wore it 3 times before it sat in the back of my closet, then I would be spending $3.33 per use. The $40 sweater provides more value, even though the $10 sweater is cheaper. That $5 organizing bucket that you used once and never touched again? Its cost per use is $5. The beautiful shoe bench in the font hall that you use every morning and night for the last 5 years? Even though it cost you $300, its cost per use is less than a penny. The shoe bench was a great buy, the organizing bucket was an awful buy. As you start seeing the value in things, you'll stop buying cheap things that you don't need and you'll have money to put into things that have value. 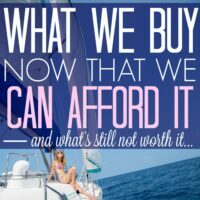 There's a limitation of course, you shouldn't buy things that you can't afford because they have value. At some point in your frugal journey, you'll have to buy cheap things or learn to do without. Drowning in debt and buying $300 shoe benches isn't something I recommend.I vote that you pile your shoes in the corner until you have a little breathing room in the budget to make the shoe bench possible. 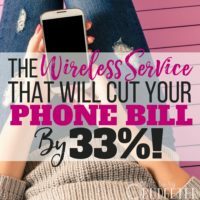 While there are tons of items that fit into this category, there are 5 major things that can cost you more in the long run if you buy them cheap. Doing research and buying quality electronics that you know will last is much smarter than buying clearance items that won't last. Buying 15 knock off phone charging cables in 3 years for $5 is much more expensive than buying one $30 apple charger. Buying the $239 laptop that's super slow and breaks in 6 months was a waste of $239, but buying a well researched computer for $600 that has a history of longevity and lasts you 5 years is a fantastic buy. Look into a subscription to consumer reports when you're in the market to buy expensive electronics. The savings of a smart purchase will offset the cost of your membership for the month. We fill our houses with things to organize it and then don't use them. We waste so much money on organizing products that aren't well thought out. You can see my recommendation for the only organizing items that you need in your home here. Skip the cheap organizing baskets, containers etc and only purchase items that have a clear purpose and are made to be durable and last for years. Hint: If you only think of the purpose when you see the organizer in the store, skip it, it's clutter. If you really needed it, you wouldn't first realize that need in the middle of Target. 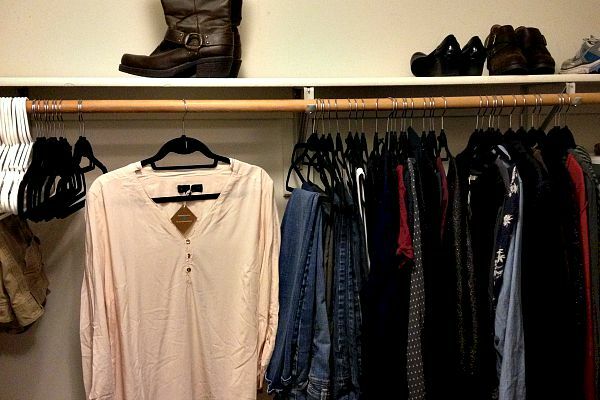 Buying only clothing that you love, is the smartest way to handle your closet. It's so hard to pass up those clearance racks of amazing deals that look okay, or will totally fit by next summer, but it will pay off big time. Go through your closet, and figure out what you have that you love and what you need. Consider a 40 hanger closet. This above picture is a photo of mine. Having 40 pieces that you love and will happily wear will give you so many more outfit combinations than a closet stuffed full of clothes that are a weird color, don't fit, don't have shoes that coordinate well, have stains, snags and are unraveling. You get the idea. Also, once you reduce your closet to that amount, taking care of your clothes is so easy! You'll find yourself using a stain treatment, and keeping everything organized. Plus, it's really hard to get behind on laundry when you only own 40 pieces of clothing. Having a house full of broken toys that no one wants or plays with is a nightmare. It's hard for your kids to keep clean, it's hard for you to keep clean, it's frustrating for you both and having too many choices for a child is actually overwhelming and is sure to trigger an “I'm bored!” whine. What if you had just 20 toys in your house total? I'm totally serious. Buying high quality toys that will last many years in quantities that are easy to keep up with is the way to go. Take a look at your ridiculous toy pile and think about how much you spent on those toys. Look at all those $5 or $10 toys that are scattered throughout the house. Think about what you could have if that mess was swept away and replaced with your cash back. When you switch to the 20 toy system, consider the purpose for the toys as well. I aim to have 3 toys that are meant to be enjoyed with mom and dad (with interaction), 5 for independent play, 2 “sets” of things that have more pieces, 4 things for outside play and the rest we fill in with his favorites. Here's a list of my favorite quality toys for my 3 year old boy. (Each item links to see current prices). High quality, durable dump truck (We bought this one at a thrift store and it's 2 years old and still looks new). This is one that I see almost every week from readers asking for help. If this sounds like you, fear not… you aren't alone. You swear you'll eat at home so you buy groceries for the week, then life happens and you eat out every night wasting all the food at home. You spend a HUGE amount on food for the week, and likely you let all of that food in your fridge go bad. This is an important cycle to break. We get so much pressure to eat healthy, and eat right, and cook at home. I've been there. The harsh reality is that you can't go from eating out most nights to cooking full meals at home 3x a day, 7 days a week. It won't happen. You'll waste an inordinate amount of trying. 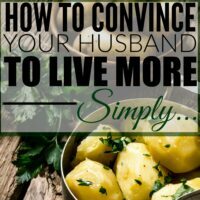 This is why I recommend 15 minute meals made with convenience foods to start when you're in that situation. Just get used to cooking at home to start, we can healthy it up in the next phase. If you know you're not ready for that, there's nothing wrong with planning your budget around eating out every day. Choose cheaper meals, and try to bring drinks and snacks to reduce the costs of that. Saying “I'm going to spend $100 in groceries this week and be cheap!” and then spending $250 on restaurants in addition to your groceries is an awful idea. Spending $160 on conscious meals out makes more sense. In the end, you want to limit the things in your life to the things that add value to your life. Eliminate spending your money on the things that you don't need or want so that you can spend money on the things that are important to you. It's that easy ! 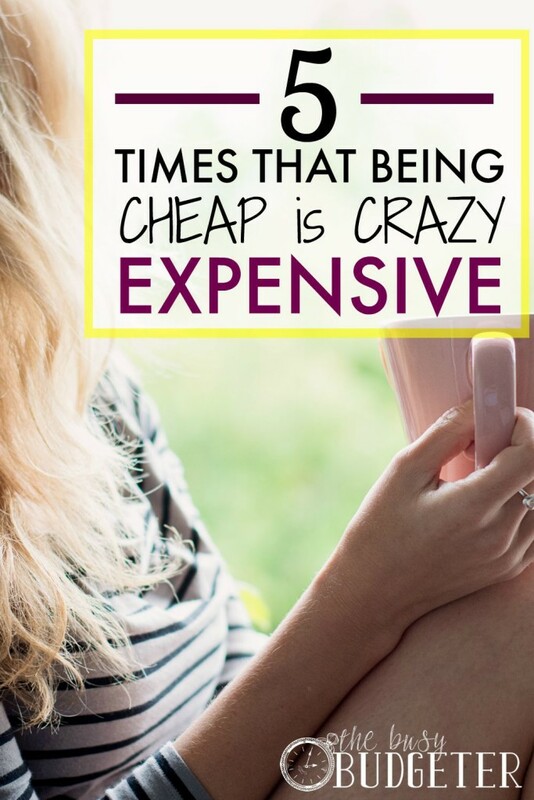 Has being cheap ever cost you a ton of money? A friend of mine and I have this conversation quite often! We always talk about how people should buy things of value. I often bring this topic up when discussing furniture. My husband and I are in the market for a new bedroom set. We decided to go with an Amish made set. They cost a bit more but will last a lifetime. Especially considering the furniture quality and pricing at department stores and mass furniture stores/outlets. I see so many people who spend a few grand here and there every so many years replacing old things that aren’t in style or have not weathered the years so well. I always stress that people should buy things they can live with for the rest of their life if they had to. Great post! I hope more people take advice like this! You’re totally doing it right! 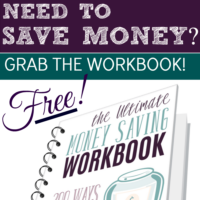 You’ll save a small fortune over your life making purchases that way! I absolutely love this post. I think it would be shocking if we went up and added the total cost on everything we don’t use in our homes. The other thing people have to consider is what is worth investing in and what isn’t. I buy cheap thrift store dishes because my kids are, well, kids. An investment set wouldn’t be practical right now. We are kindred spirits Kal! I practically live at the thrift store! I will agree with cheap toys. When we were kids, we would get something for Christmas and it would break right away. Thanks for your comment Rachel. We had that fun experience over Christmas! Another bad one for me is cosmetics. I can’t tell you how many times I have decided against buying a high quality but expensive product I love, in favour of a dupe that looks similar but ends up pairing in comparison when it comes to quality. It’ll either not last as long, or I’ll get tired of it and end up shoving it into the back of my makeup drawer with all the other products I forget to use! Yes! I bought a bunch of diapers and a box of pull ups during no tax week, thinking my daughter would need them. I saved tax money. But now my daughter does not wear diapers or pull ups. Sams club changed their packaging for the diapers and pull ups and won’t take them back. We are stuck- $60 of diapers/ pulls ups that we won’t use for $7 saved in tax. Try finding a local swip swap site on Facebook. You can recoup some of your money. Such a great topic to cover! Another one is cheap parts on your car. Don’t do it! Get a reputable mobile mechanic and good parts that come with a warranty! I found myself learning this with kitchen tools. We used to buy the $1-4/ spatulas from the value section of Walmart or even the dollarstore. They’d last a few months maybe a year. At some point, I was given a very high quality spatula. We STILL USE IT! !,For nearly 10 or 12 years!! It’s $30 upfront bUT now we have 3 of them! The first one was and still used nearly 12 years! Yes, Electronics items are of the most expensive. I was not aware about this at all. I have bought lots of unnecessary products which are not necessary.